Do you source and/or recruit software engineers? Would you like to know how to find software engineers on Stack Overflow who are actually interested in hearing about new career opportunities? If you answered YES!, YES! and YES! – you’re in in luck, because I am going to show you how to find active and passive job seekers on Stack Overflow for free. Stack Overflow offers a careers section to their website where Stack users can search for jobs and where recruiters can go to search for people who are either actively or passively looking to make a change in their current employment situation. Stack Overflow claims their careers section has approximately 138,000 candidates, comprised of 30,000+ actively looking for a job and 108,000+ passive candidates who, while not actively looking, have indicated they are open to offers. It’s always helpful to be able to identify people who are open to discussing opportunities to make a change from their current employer. When you review the results, this is what they look like (see below – I blurred identifying information). It’s nice to see what each person is ideally looking for, which is obviously very helpful when assessing the level of match between your opportunity and each person you’re reviewing, as well as when engineering an effective message to increase the probability of a response. In addition, you can quickly check out their Stack reputation and top answers which can give you a sense of their knowledge and skill/expertise. 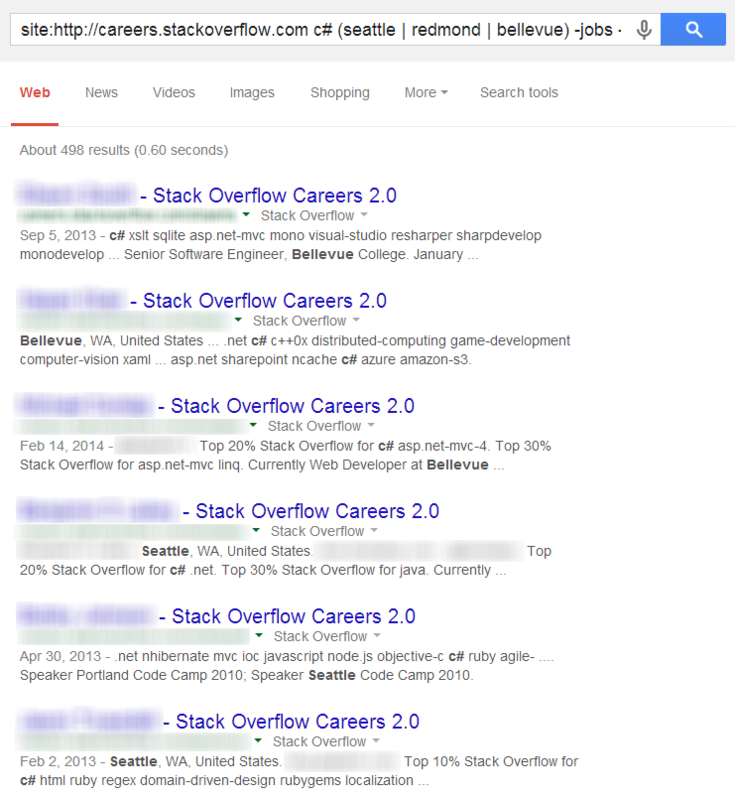 I wrote a post back in August of 2013 on how to search Stack Overflow to find people by reputation and by achievement. 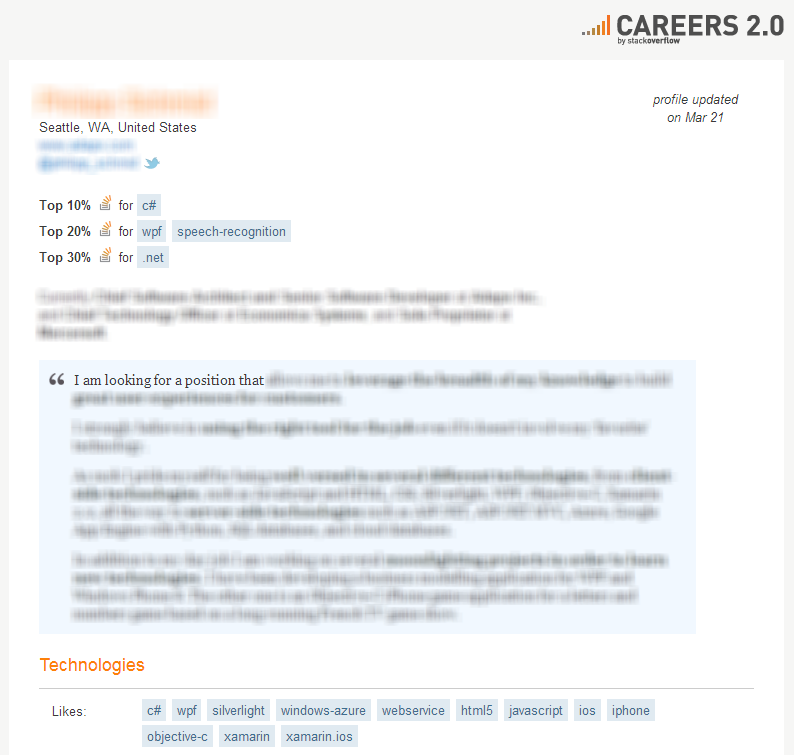 If you source/recruit software engineers and you haven’t read the article, as it shows you how to find anyone on Stack Overflow among the 2,700,000+ users and not just those people who happen to have a Careers 2.0 profile (about 5% of all users). 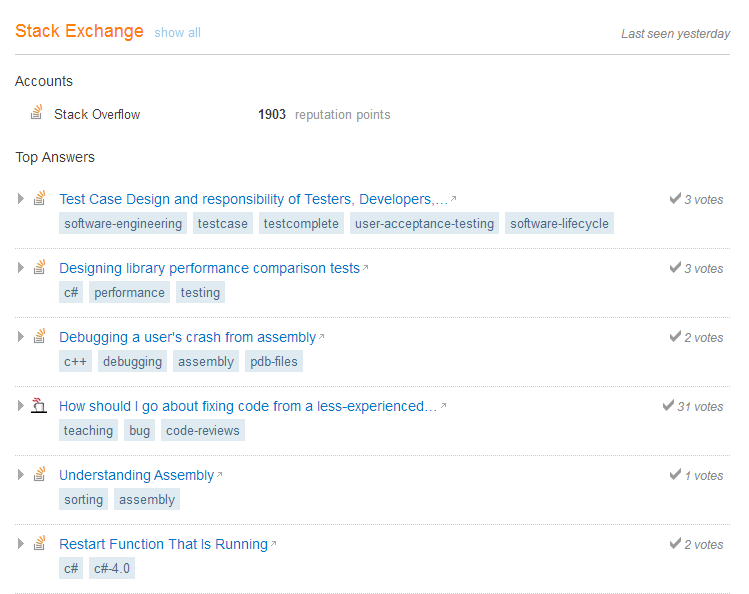 While it’s great to be able to X-Ray search Stack Overflow career section profiles for free, it’s like performing surgery with a butter knife – it’s no where near as precise as if you were searching their 130,000+ active and passive candidates using Stack Overflow’s search interface. 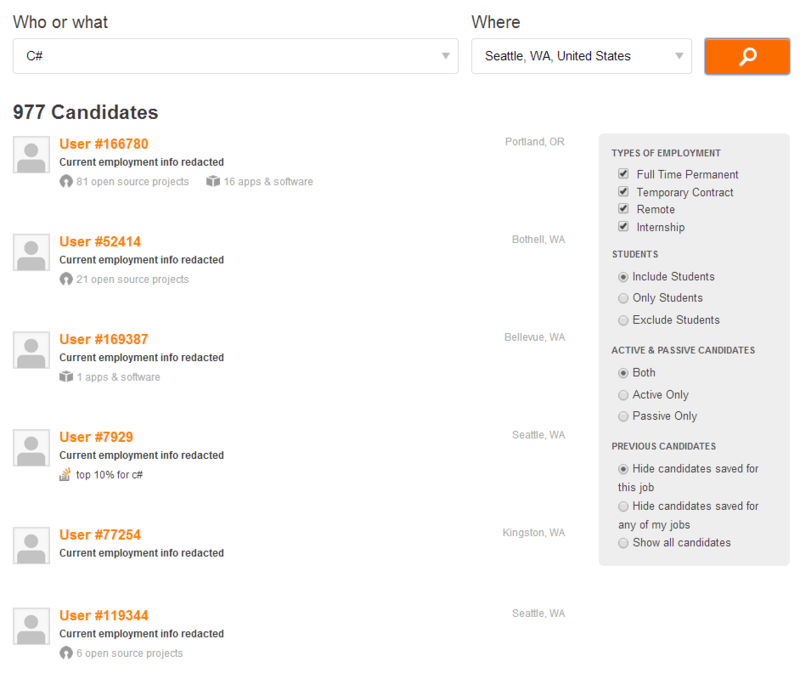 Stack’s Careers 2.0 search interface allows you to refine by employment type (perm, contract, etc. ), student/non-student, active/passive, and to not show people you’ve already saved for a specific job. Perhaps the most valuable thing about using Stack’s Careers 2.0 search is the location search functionality. I searched a location of Seattle, and you will see that Stack Overflow’s search also finds nearby locations, as well as people who live in other areas who are willing to relocate to the Seattle area – which is awesome and extremely helpful/valuable! With X-Ray searching Stack Overflow – whether the careers section or otherwise – not everyone is going to mention the exact city you’re looking to find people in on their profile. As I always say, the value of human capital data is directly proportional to the depth and searchability of the data. While Stack Overflow profiles are often data-rich, compared to Stack Overflow’s own search interface, using Google to search for profiles scores lower on the “searcahbility” scale. If you’re really serious about extracting maximum value from Stack Overflow in your recruiting efforts, you may want to contact Stack Overflow at +1-877-782-2577 or email them at careers@stackoverflow.com to learn more. They even have a 90-day Money-Back Guarantee – they “don’t want your money if you’re not amazingly happy!” Some people must be amazingly happy – they have over 5,000 Careers 2.0 customers.